GAEMS, Inc. is continuing their commitment to gamers by making Personal Gaming Environments available at all GameStop Locations in the US and EB Games in Canada. They are also committed to bringing next generation gamers the personal gaming experience they deserve. GAEMS Vanguard with integrated 19"class LED monitor! 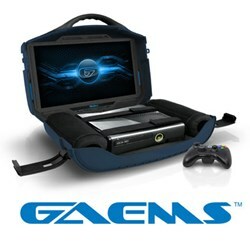 GAEMS makes console gaming possible where nobody else can! GAEMS, Inc. announced today that effective immediately customers will be able to buy their award winning Personal Gaming Environments (PGE) products at any GameStop locations in the USA and all EB Games locations in Canada. This expansion is designed to help meet the growing demand for their virtually lag-free monitors built specifically for console gaming. GameStop is the first major retailer in the USA to bring GAEMS Personal Gaming Environments to all of their locations, and EB Games in Canada is one of the first to bring GAEMS products to all locations in Canada. Check here for the location nearest to you. GAEMS also announced that their legacy and current products will functionally work with next generation consoles being released in the next few weeks, although a kit may be required for one of the consoles for optimal protection in transit because of the larger size and shape. GAEMS products perform virtually lag-free with major consoles and allow their customers to enjoy the best gaming and entertainment experience possible without the traditional limitations of a stationary setup in a living room or other location. GAEMS PGE have garnered respect from pro gamers that have requested the Vanguard be the only monitor they wish to use in competition. Serious gamers praise the performance and portability that allow them to game more often in places they never thought possible like office break rooms. Casual gamers and families have praised the product for its durability and the freedom it brings them for reclaiming the family TV without ostracizing the gamer in the family. GAEMS, Inc. has been building Personal Gaming Environments since 2011 and has worked diligently to build a reputation for quality, monitor performance and customer satisfaction. Personal Gaming Environments come in various sizes but all of them are TSA friendly and fit carry on luggage requirements. The GAEMS G155 and Sentry sport 15.5" monitors, stereo speakers and dual audio output jacks for 2 sets of headphones. GAEMS Vanguard products have an integrated 19" class LED monitor with metal-coned and chambered stereo speakers and dual audio output jacks also.